I bought the $55, 1-pound June Taylor Christmas Cake online, and then paid an additional $14.90 for shipping to the middle of the country (from Oakland, California, where June Taylor is based). So $69.90 later, a very small, one-pound loaf arrived. Needless to say, this is a very expensive cake, $3.40 per ounce without shipping, $4.37 per ounce if shipping is included, so I certainly had my hopes up. I hope that's clear (but it probably isn't, knowing me). There are candied citrus peels in this cake, but the rest is dried fruit, including plums, apricots, and cherries. And, unfortunately for this writer, there are a lot of grapes and golden raisins. A LOT of those little guys. Locally sourced, yes, but still a lot of them. Regardless, this is a nice clean, wholesome list of ingredients. 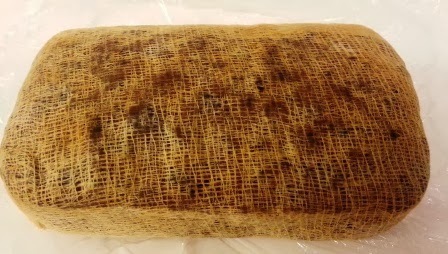 Upon unwrapping the cake, you find a cute little loaf wrapped in cheesecloth. Per the little note, "your cake has been washed with an aged brandy and wrapped in cheesecloth to keep it moist:"
A nice proportion of fruit to cake, but not very pretty--everything is very brown. Definitely not a super festive-looking cake. So on to the taste. Well I've been hinting at it with the reference to ALL the grapes/raisins: this cake had that sort of grapey, burnt taste that is not my favorite. I think this also may be due to the inclusion of the dried plums. Come to think of it, port wine is also grape-based, a fortified wine, so gosh, that's a heck of a lot of grape in this cake. The cake itself has a nice dense crumb and a rich flavor due to the brown sugar, spices, and alcohol, but I have to admit that I was a bit disappointed with the flavor. I was expecting something a bit more dynamic or original. 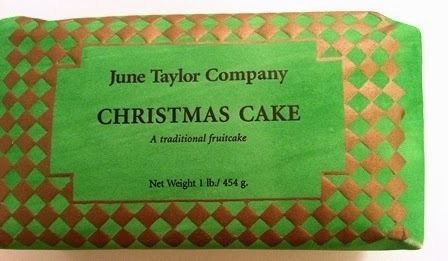 Certainly, June Taylor calls this a "traditional Christmas cake," so is certainly not marketing this as anything more than that, and in that sense it fits the bill. I did find the cake to be just a bit dry when I first tried it. Referring back to the note packed with the cake (a very useful reference, that), they recommend that it "can periodically be refreshed with more brandy." So before wrapping it up, I brushed a bit of cognac on the outside, re-wrapped in the cheesecloth and put in a storage bag. I also followed the instructions on the note to "refrigerate until the cake is cold and using a sharp knife thinly slice the cake and bring back to room temperature to serve." The next time I tried it, I did just that, let it come back to room temperature before trying it, and that also helped--the flavors and aromas expanded and became more complex. So I can say I tried to give this cake the benefit of the doubt. This is certainly a delicious, well-made cake sourced from local ingredients and made with care. If you care about food made from "quality ingredients" from "local farmers and artisan producers" (again from that note), then certainly this would be an excellent cake to purchase. And this cake is indeed an experience: the entire experience shows a desire by June Taylor to create a beautiful, well-crafted cake, even down to the wrap. However, face it, this cake cost a lot of money, and for that money, didn't deliver anything terribly original. If you're trying to balance quality with value, I would recommend checking out the Jampot (Holy Transfiguration Skete), Old Cavendish, or even one of the Bien Fait cakes for something similar at a lower price. Some of us cannot bake, but since you can, why don't you try this one and report? Hi Anonymous, good idea, I think I will get more into making them, and I've heard that one's a good (though expensive) one to make! In September, I noticed "Marabissi Panforte Di Siena Margherita" on Amazon, thinking it would be a fruitcake-like thing my wife would like. It's really not -- candied fruit and almonds. Not great. But speaking of making fruitcake, I just caught an episode of Mo Rocca's Cooking Network show that showed a Jamaican Black Cake being made by Vanetta Willams (lately of the Bronx). Looks a lot like a fruitcake, to me. 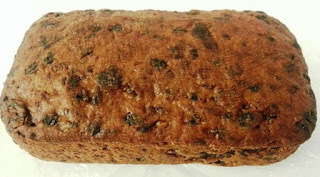 Here is the web reference: http://www.cookingchanneltv.com/recipes/jamaican-black-cake.html . And you being in NYC, you should be able to find a black cake ready-made. 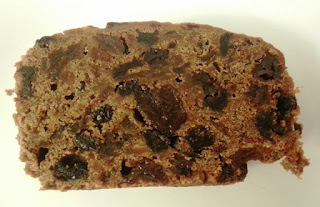 See this entertaining NY Times article by Julia Moskin, http://www.nytimes.com/2007/12/19/dining/19cake.html?_r=0, who writes "Because of the soaking of the fruit and the use of brown sugar and a bittersweet caramel called browning, black cake is to American fruitcake as dark chocolate is to milk chocolate: darker, deeper and altogether more absorbing." Hi Greg, you didn't like panforte? I loved it. I'm not in NY, I'm in Chicago, but I've definitely heard of Black cake and want to try it. I think the Skate monastery makes one. The "New Skete Monastery" doesn't show black cake online. But some Googling found Caribbean Wedding Cakes, http://www.caribbeanweddingcake.com/BlackRumFruitCake.asp . Expensive, and they "bake to order". Yum! I think Skate had it in their fruitcake sampler. Anyway, definitely one to try! islandsweetstuff.com on St. Thomas doesn't look to be set up for mail order, but I like the exuberance of their ad: "As we've been told, many people have been known to enter into a euphoric state of bliss after eating one of our delectably divine cakes!"